An evening at AMP with Ocean Orchestra and The Kennedys! A small group of Washington Revels singers will join singer-songwriter/musician Jennifer Cutting and her Ocean Orchestra at this CD release concert of their newest recording, Waves. Those singers recorded back-up vocals for “Song of the Sun,” which is on the recording. They will join the ensemble to sing that song and “Steady as You Go,” a beautiful and poignant piece that Jennifer wrote as an affirmation of the cycle of life and the support of community during a loved one’s transition beyond. The remainder of the concert will feature Jennifer and Ocean performing the other songs on the CD, plus a performance by The Kennedys. 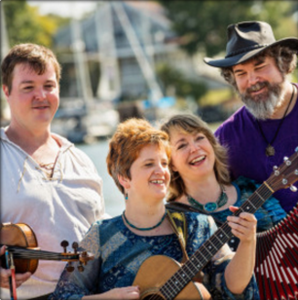 Washington Revels’ relationship with Jennifer dates back over 25 years, when Revels combined with her then-current British folk-rock band, The New St. George, to present 3 winter solstice programs at the Birchmere during the early 1990s. Revels singers have recorded other songs with Jennifer and performed with her at Strathmore and other venues. Together with Steve Winick, Jennifer is now a regular song leader for Washington Revels Pub Sings. For more information and tickets, visit AMP by Strathmore’s website. DATE/TIME: Friday, March 31, 2017, 8-10 pm.